With today's increasingly hectic lifestyles, not only do our minds take a beating thanks to stress levels and the constant need to be better than the rest, but our bodies suffer too with irregular eating habits, unhealthy diets of snacks and fast-food and crazy work hours. Constipation means different things to different people. For many people, it simply means infrequent stools. For others, however, constipation means hard stools, difficulty passing stools (straining), or a sense of incomplete emptying after a bowel movement. The cause of each of these "types" of constipation probably is different, and the approach to each should be tailored to the specific type of constipation. With constipation stools are usually hard, dry, small in size, and difficult to eliminate. Some people who are constipated find it painful to have a bowel movement and often experience straining, bloating, and the sensation of a full bowel. Some people think they are constipated if they do not have a bowel movement every day. However, normal stool elimination may be three times a day or three times a week, depending on the person. Constipation is a symptom, not a disease. Almost everyone experiences constipation at some point in their life, and a poor diet typically is the cause. Most constipation is temporary and not serious. Understanding its causes, prevention, and treatment will help most people find relief. Constipation is one of the most common gastrointestinal complaints in the United States. More than 4 million Americans have frequent constipation, accounting for 2.5 million physician visits a year. Those reporting constipation most often are women and adults ages 65 and older. Pregnant women may have constipation, and it is a common problem following childbirth or surgery. Regular exercise is often the best and easiest way to make sure your mind and body are revitalized. An active lifestyle ensures that your body gets the exercise it requires while improving appetite and digestion. Constipation may probably be the main cause of most ailments common to humans. 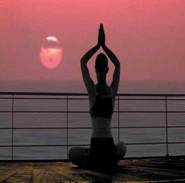 Yoga is the practice of different postures as a form of physical exercise and meditation. A number of positions in yoga may be beneficial in relieving bowel problems in people suffering with constipation. Abdominal lifts and knee-chest positions can increase intestinal motility and promote bowel regularity. Yoga can provide solution for each and every health problem. Practicing yoga regularly can ensure a healthy life. Yoga has proven very effective to treat the health disorder like constipation. As most of the yoga postures for constipation focus on the abdominal movement, it makes easier to pass the stools. Such asanas also help to improve the human digestive system and therefore cure constipation. These yoga postures will not only cure your constipation but also relive your from other disorders if combined with proper diet and adequate sleep. The ability of yoga to pump blood to various organs helps in the healthy functioning of organs and the organ systems of the body. When you perform Seated Forward Bend, your abdominal organs are compressed and massaged. This stimulates your colon movement and thereby helps excretion system to function better. To perform this pose completely, while bending forward, do not forget to pull in your stomach to massage the abdominal organs. Marichi Pose (Marichi's pose) or Marichyasana is a twist sitting pose. The pose purifies the body by wringing toxins out of the internal organs. When you twist your torso, the intestine and colon inside the stomach are stimulated. Yoga locust pose provides massages to the lower abdomen, enforcing the colon’s movement which in turn easing the excretion system. These postures free energize and balance the body. Sitting twists are the most intensive, as they increase the range of motion of the spine. They promote flexibility in the spine, hips and upper back, thus relieving backaches, headaches, and stiffness in the neck and shoulders. This group of postures also tones and stimulates the abdominal organs, thus aiding digestion and relieving constipation. Ideally, twisting postures are done after a series of sitting poses or forward bends, which gives the hips and spine a proper warm-up. When done after backbends, they tend to relieve any lower back discomfort. This is a wonderful Asana for improving digestion. The whole abdominal organs are properly toned and stimulated well by the increase of intra-abdominal pressure. Sluggishness of liver or hepatic torpidity disappears. It tones the bowels and removes constipation (ordinary, chronic and habitual). It awakens Kundalini. The whole abdominal organs are properly toned and stimulated well by the increase of intra-abdominal pressure. Sluggishness of liver or hepatic torpidity disappears. It tones the bowels and removes constipation (ordinary, chronic and habitual). It awakens Kundalini.The important physiological aspects of this posture (asana) are that it stimulates the pancreas, liver, spleen, kidneys, stomach and ascending and descending colons. This is highly useful to control diabetes and kidney troubles. This posture makes the spine elastic. Nerves of the spinal column are toned up. This improves the efficiency of the abdominal viscera, such as liver, spleen, pancreas and the intestines. This eliminates the problems of constipation and dyspepsia (loss of appetite). Artha Matsyendrasana is a wonderful asana and gives you a very high standard of health when practiced in combination with the other asanas of forward and backward bending. • In this posture twist the waist laterally. • Exhale and twist the waist in this posture. • Inhale after you return to normal sitting position. • Symmetry should always be maintained. • If you twist your body six times to the left, you should also twist your body six times to the right. This is a wonderful Asana for improving digestion. It destroys the effects of unwholesome food, and increases the digestive power. It cures dyspepsia and diseases of the stomach like Gulma (chronic gastritis), and reduces spleenic and liver enlargements by increasing the intra-abdominal pressure. The whole abdominal organs are properly toned and stimulated well by the increase of intra-abdominal pressure. Sluggishness of liver or hepatic torpidity disappears. It tones the bowels and removes constipation. • Kneel on the ground. Sit on the toes. Raise the heels up. Join the two forearms together. Place the palms of the two hands on the ground. The two little fingers must be in close touch. They project towards the feet. • Now bring down the abdomen slowly against the conjoined elbows. Support your body upon your elbows that are pressed now against the navel or umbilicus. • Stretch your legs and raise the feet stiff and straight on a level with the head. • When the Asana is in full manifestation the head, trunk, buttocks, thighs, legs and feet will be in one straight line and parallel to the ground. This posture is very beautiful to look at. • Practise this Asana from 5 to 20 seconds. • Retain the breath when you raise the body. When you finish the Asana, exhale slowly. Bhujangasana makes the spine flexible, removes constipation, and prevents Arthritis. The lungs become strong. Bhujangasana should be practiced along with Shalabhasana and Dhanurasana for deriving maximum benefit. Bowel movement is free and you will not suffer from any major old age problems. You can maintain good shape of the body throughout the life span. • Sit with your legs fully stretched out. Bend each leg at the knees and place your feet on the other hip joint. Both the heels are adjusted in such a way that each presses the adjacent portion of the abdomen. This forms the foot-lock in a sitting position. • Bend backwards and, exhaling, rest your weight on the elbows. Push your neck backwards and slightly rise the hip upward thus making an arch of the spine. • Then, by making hooks of the forefingers, hold your toes on the corresponding side without crossing your arms.This posture should be maintained for some time with slow and deep breathing. • For reverting to the original position, release the foot-lock and return to the supine position by lowering the arch. It brightens the psychic faculties and awakens Kundalini Sakti, removes all sorts of diseases of intestine and stomach, and augments the mental power. It supplies a large quantity of blood to the roots of spinal nerves. The muscles of the abdomen, the rectic muscles and the muscles of the thigh are also toned and nourished well. Obesity or corpulence and habitual chronic constipation, Gulma, congestion and enlargement of the liver and spleen are cured by this Asana. • Lie on the back quite flat. Slowly raise the legs. • Lift the trunk, hips, and legs quite vertically. Support the back with the two hands, one on either side. Rest the elbows on the ground. Press the chin against the chest. • Allow the back-shoulder portion and neck to touch the ground closely. Do not allow the body to shake or move to and fro. Keep the legs straight. • When the Asana is over, bring the legs down very, very slowly with elegance and not with any jerks. • In this Asana the whole weight of the body is thrown on the shoulders. You really stand on the shoulders with the help and support of the elbows. • Retain the breath as long as you can do with comfort, and slowly exhale through the nose. Shalabhasana is useful for stomach. Lumber, waist portions and to the legs. Practice of this asana removes constipation. The waist remains trim if you practice Shalabhasana regularly. • First rest in Makarasana. Then keep the hands below thighs and raise up both the legs together. • The legs should be as straight as possible. • Inhale and remain in this posture for a few seconds and then relax. • Repeat this three to six times initially. After gaining sufficient experience you can remain in Shalabhasana for a longer duration, at a stretch. • For easy practice start with each leg separately for six times. Then you can try raising both the legs. Halasana makes the spine flexible. Halasana improves the strength of the muscles and nerves of the spine. Blood circulation to the neck is increased. The waist becomes free from excess fat. The stomach is pressed well and the abdominal viscera improve their function. Digestion is improved. Constipation is removed. Practice of halasana slims the body. • Before trying Halasana you should practice Khatwangasana for a week. • Then bend the back and touch the floor with the toes as shown in the picture. • Hands can be spread on the floor as in the picture it kept locked near the hand. • Breathe out (Exhale) and draw in your abdomen for easy practice of Halasana. • Bend the back according to your capacity, but do not strain too much. Don't exceed your limit. Slow and steady practice leads you to success.